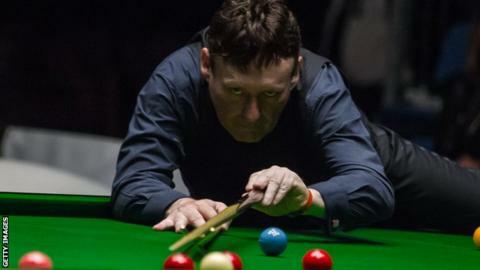 Jimmy White beat 11-time women's world champion Reanne Evans in a scrappy match at the Snooker Shoot Out. White, 56, won 54-26 at Watford Colosseum as Evans, 33, became the first woman to compete on television in the final stages of a ranking event. Former world number three James Wattana, meanwhile, lost to 14-year-old Ben Mertens by just one point. Ricky Walden made Thursday's highest break with a run of 132 against 12-year-old Liam Davies. Six-time world finalist White met Evans in the last match of the day. Evans was only seven points behind with 90 seconds remaining when she missed a red into the centre pocket, and White made a 21 break to secure victory. The one-frame matches each last for 10 minutes, with players given 15 seconds per shot for the first five minutes but only 10 seconds for the final five. Players who fail to adhere to the clock are penalised five points, or the value of the ball they are playing. Wattana was among the players to be timed out. The 49-year-old Thai was well positioned to pot the remaining pink and black when the klaxon sounded to signal the end of the match. Michael Georgiou, who beat Graeme Dott in last year's final, beat former world champion Peter Ebdon in the opening match of his title defence while German Masters winner Kyren Wilson overturned a 60-point deficit to beat Ian Burns. Former Masters champion Alan McManus forgot his chalk as he came into the arena for his match with Sanderson Lam, but a break of 54 helped the Scot into the last 64. Emma Parker - the second female player in the competition - plays India's Laxman Rawat on Friday.